Its west orientation allows you to contemplate on the balcony, beautiful sunsets, while sipping a holespinette (local aperitif) or tasting smoked ham mogettes or sardines of Saint-Gilles. For rates, contact us specials may appear. In Saint-Gilles Cross of Life (2 kms), fishing and pleasure ports, markets energize the seaside resort all year round. Your baby will be well received, we put at his disposal: bed, chair and bath. Free and unlimited internet access. We love our Vendée and we will be happy to help you discover it. The newly renovated bathroom (January 2016) is equipped with a shower, a washbasin on a double drawer cabinet, topped with a mirror .. You will find a hairdryer. We thought about baby with the little plastic tub. The kitchen is equipped with an aluminum table and aluminum chairs and textilene fabric that can be put on the balcony of 7 m². These high quality products are very pleasant. This arrangement gives the apartment a zen atmosphere, lightly loaded. The fridge has a freezer compartment. The compact robot magimix allows you to cook at home. Basic commodities (oil, vinegar, pepper, salt, mustard are provided as well as dishes and laundry products) The cellar in the basement keeps cool good bottles. In the garage on the ground floor, 2 bikes are waiting to help you get the morning baguette and croissants. The property was all we expected and more. The view was spectacular, the apartment was clean. We had a a wonderful stay, our hosts were kind and lovely. The apartment had all we needed. The heating adjusted automatically depending on the weather. The view was spectacular and it was very peaceful. We didn't even have to leave the apartment to be on the beach, the soothing sound of the sea was all you can hear at night. We witnessed the most beautiful sun rise and sunset we have ever seen. A lovely bakery can be found about 5 minutes drive from the apartment and a supermarket too. I really cannot fault this place. There is a tourist office nearby which can provide you with information on activities in the local area. There's a market on almost everyday they are in different villages, hence they are all unique and worth visiting: giving you the pleasure of tasting local delicacies. Merci Francoise et Michel nous avons passé un très bon sejour. Les enfants ont aimé l'endroit et les vélos. Pour tous ceux qui aiment se promener près de la mer. Bel appartement! We had a wonderful stay at St Hilaire-de-Riez. The apartment is right on the water, and we went to sleep with the sound of waves. There's a beach right across the street. This is a lovely area to tour with many excellent restaurants. The owners, Francoise and Michel, are exceptional and even came over in the evening to show us how to operate the heat. I would recommend this place without reservation. Nous sommes tombés sous le charme de cet appartement excellent accueil lors de notre arrivée avec un petit geste très apprécié. Une Vue exceptionnelle belle Sur l'océan ainsi que sur l'île d'yeu. Un Grand MERCI aux sympathique propriétaire pour avoir contribué formidable séjour dans cette belle région. Une belle semaine à St Hilaire ! Nous avons passé un très bon séjour dans un appartement lumineux face à la mer et bien équipé. De belles promenades à pied ou en vélo sont possibles à partir de l'appartement. Les contacts avec les propriétaires ont été très agréables. Agreable sejour, l appartement récent offre une vue imprenable sur l ocean et les propriétaires ont le sens de l accueil. Les 2 vélos mis à disposition sont un plus, hébergement à recommander . In Saint-Gilles Croix de Vie (2kms), the fishing and pleasure harbors, the markets energize the seaside city all the year. 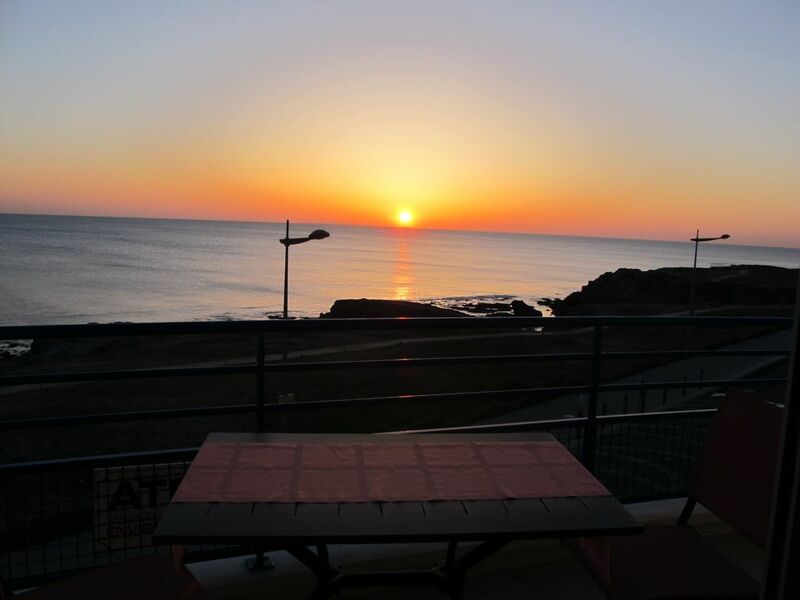 The Vendée cornice reveal its three kilometers of wild rocky coast where you will enjoy strolling on foot or by bike. A bike path runs along the sea, crosses the city and winds through the forest over several tens of kilometers. Other discoveries available to you: the salt marshes, the island of Noirmoutier with its bridge and above the Passage du Gois, the Ile d'Yeu an hour's boat, the Puy du Fou with its large park cinéscénie.